Most poets are known by the age to which they belong, but there are some whose age is known by virtue of their towering presence. Transcending the narrow bounds of moment, race and milieu, such poets often belong to the common heritage of mankind. Valmiki, Vyasa, Homer, Kalidas, Virgil, Dante, Shakespeare, Milton, Goethe and Whitman were essentially such poets. Their Weltanschauung was the defining moment for their age as much as it was for the successive generations. In our times, if there is one poet who has a legitimate claim to being called a Yug Purusha, it is undoubtedly Pablo Neruda. In a way, the 20th century shall remain indebted to this Chilean poet that he chose to live through most of it. 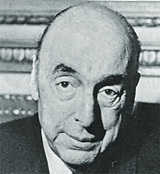 Born at Parral on July 12, 1904, into a middle-class family, Pablo Neruda’s real name was Neftalí Ricardo Reyes Basoalto. His mother died shortly after his birth, and his father, a railway employee, remarried and moved to Temuco, a frontier town in southern Chile. It was here that "poetry arrived/in search of me," as he claims in his self-reflexive poem, Poetry. At 16, when he moved from Temuco to Santiago, he was already an established poet. His decision to adopt the pseudonym of Pablo Neruda, after the then well-known Czech poet Jan Neruda, signified a refusal to be limited by his provincial background — he wanted to belong to the whole wide world. To an extent, his second collection Twenty Poems of Love (1924) does reflect this pre-occupation with the cosmic self. Identifying cosmic nature with two women, one from Santiago and the other from Temuco, (both of whom are addressed in the poems), Pablo Neruda explores the universe with the urgency of a pioneer. It’s another matter that his sense of mystery often gets the better of his urge to codify, name or discover. In his poem Every Day You Play, he wonders: "Who writes your name in letters of smoke among the stars of the south? / Oh let me remember you as you were before you existed." His diplomatic assignments first took him to Rangoon, Colombo and Java and then to Barcelona and Madrid as a Consul. From 1924 to 1929, five years that he spent in the East, cut off from spoken Spanish and lonely to the point of desperation, were, indeed, the most torturous. In a letter to one of his friends, he once declared how he often "picked up stray dogs for company." Loneliness, exile and the resultant fragmentation of the self are etched in the collection Residence On Earth (in three volumes), the first of which was published in 1933. If his return to the Chilean soil in 1934 helped Neruda reclaim his relationship with his people, language and community, it also pulled him into the thick of workaday politics. The Spanish Civil War and the rise of fascism dictated his politics. And his sense of resurrection was to later find its way into his next collection Canto general, a 15-section Chilean epic not published until 1950, in which order and meaning ultimately flowed back into his poetic universe. In I’m Explaining a Few Things, he laments, "Treacherous/generals:/see my dead house, /look at broken Spain." More than a private act, Neruda regarded poetry as a public utterance, for he believed that "For human beings, not to speak is to die," and "I utter and I am." In 1945 once he had formally joined the Communist Party and become a Senator, too, his involvement with people and ordinary workers had become truly obsessive. Now he had begun to read his poetry aloud at trade union meetings and political rallies. As one of his critics Jean Franco puts it, "Canto general reveals the true story of the Americas, their geography, the oppression of its people by the conquerors and dictators." In this poem, Neruda, the Oracle, decodes the enigma of stone or listens attentively to the secret language of river and forest: "Now talk to me, Bio, Bio,/…you gave/me the language, the night time song/mingled with rain and foliage." After Canto general, Neruda started showing greater predilection towards poetry as a mode of uncluttered, clear-sighted communication. It was with the idea of communicating even with the non-literary public that he composed Elemental Odes in 1954. Written on objects as diverse as bread, bed, tomato, clothes and violin, these odes celebrate Neruda’s love for the commonplace. In his Odes on the Clothes, he can’t resist saying: "and you will sicken gradually/clothes,/ with me, with my body/and together/we will enter/the earth." The autobiographical strain became more pronounced in his later rather than his early poetry. It was only after his marriage to Matilde Urrutia in 1955 that he sought to revive love poetry, first in The Captain’s Verses (1952), and then in One Hundred Sonnets of Love (1959) addressed to his wife. In 1971, he was in Paris on an ambassadorial assignment when the announcement came that he had been awarded the Nobel Prize. The next year when he returned to Isla Negra, already a sick man, Chile was on the edge of a civil war. In an interview with his long-time friend and biographer, Margarita Aguirre, he declared, "This is a heart-rending moment for Chile…it invades my study and there is no option but to go on participating in this long struggle." On September 11, 1973, as he lay mortally sick in Isla Negra, first the navy rebelled and then the army. Allende, who had risen to the Presidency in 1970 and under whose leadership Chile had taken definite steps towards socialism, was killed, leaving Neruda to die in abject disillusionment, exactly 12 days later.